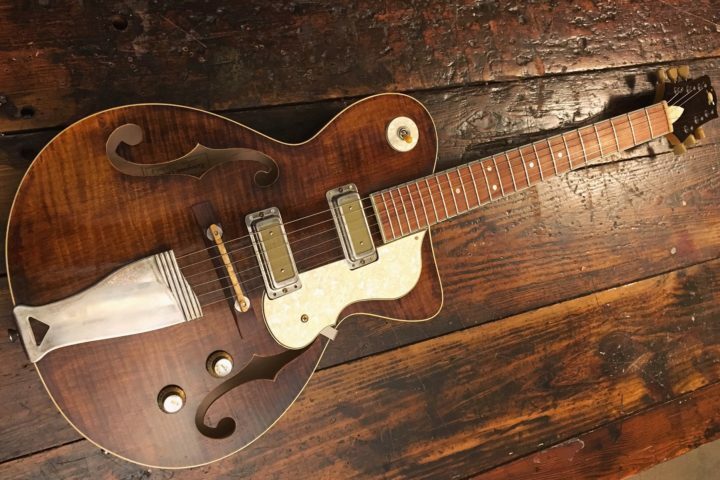 Down in sunny Santa Cruz, California, there’s a guitar builder you need to know about—and it’s not the one you’re probably thinking of. 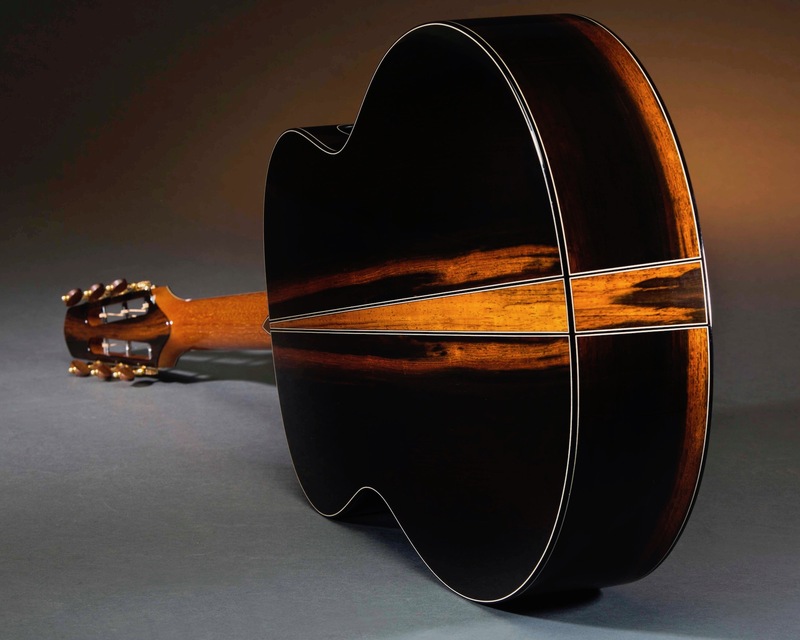 Ed Claxton has made a name for himself in his nearly 50-year career as a builder of some of the finest sounding and most beautiful looking steel string acoustic guitars out there. He admits he may not be the household name like some of the big companies or popular artisanal builders, but those who know him regard him as an artist and a legend. 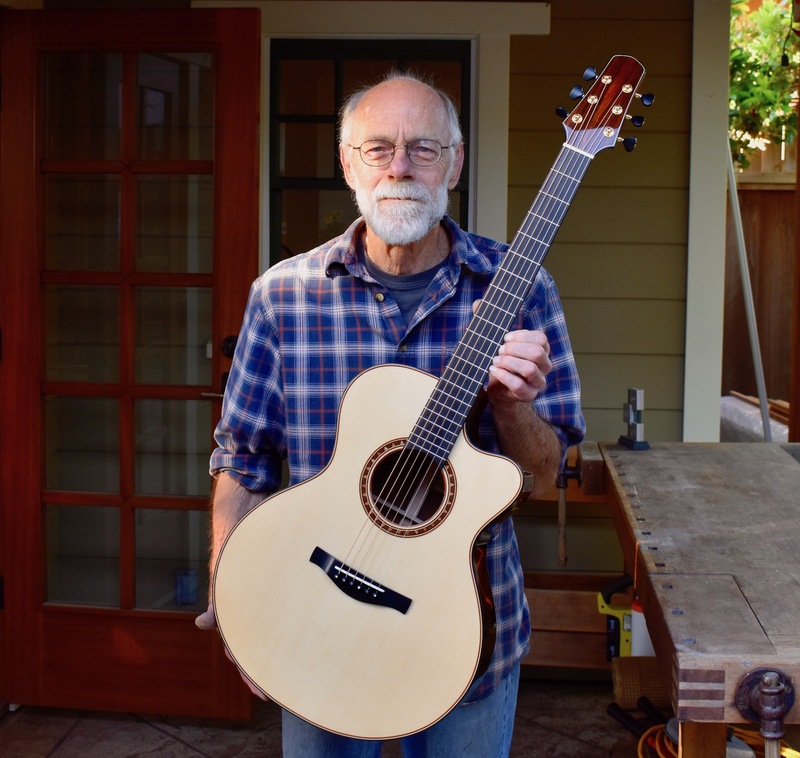 His path in becoming a guitar maker has been…non-traditional (if there ever was a traditional path to guitar making), taking him as far as Greece to restore and sail historic wooden ships, but he’s happy with the life and guitars he’s built over the years. As he’s beginning to slow down his operation, Ed led us down the rabbit hole, giving us a glimpse at the guitars and everything surrounding them. Ed Claxton: Right now, I have a couple EM models going (shown below), Brazilian and European spruce. 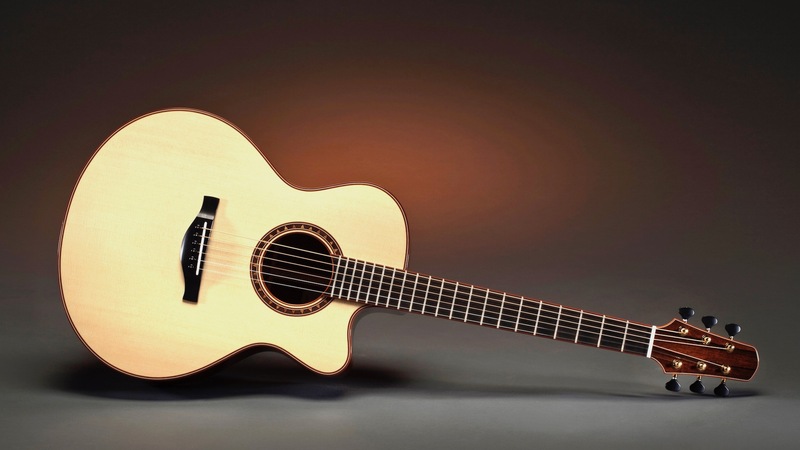 It’s a small jumbo that fingerstyle players tend to really enjoy. That’s my standard workhorse. I make more of those than anything else by far. I have five standard models, but the EM probably takes up 75 percent of the orders. I’ll make the occasional classical guitar, I used to make a lot more when I was first starting out, but I just gravitated toward steel string guitars early on. So, those two EMs are my focus right now. I’m hoping they’re going to musicians because I get a lot of collectors ordering my guitars, and I want them to be played! I’m 70 years old now, and I’m having to slow down a bit which has been the plan, but I’m still doing everything myself. EC: I started building stringed instruments in 1969 when I was a student at the University of Texas, Austin. The university had this huge arts and crafts shop for pottery, jewelry, woodworking, and whatever else, and I wanted to go in there and teach myself to throw pots on a wheel. I saw these two guys in there, these two philosophy professors, and they took over this whole corner of the woodshop and were building North African instruments like ouds but also bouzoukis and all kinds of other stuff. 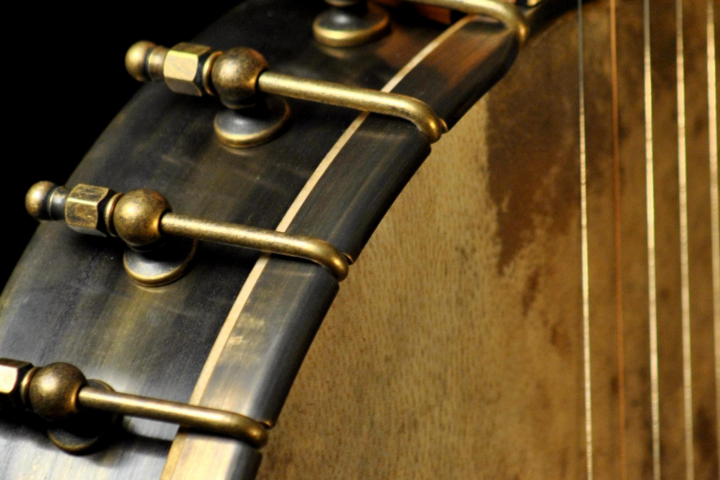 One of them was a real computer whiz and when he was making an oud, which has a back like a lute with tapered and proportioned ribs that you glue together, he was able to calculate the precise shape and size the ribs needed to make the instrument right. I had never even heard of a computer at that time! But anyway, these guys were geniuses, very artistic. We had a great time. In fact, my day job at the time was 8 at night till 1 in the morning at this hamburger stand, and one of those guys was my boss, so I’d work with him at night then we’d go into the shop together the next day and build instruments. We did that for a couple of years, building together and then building on my own, ouds or whatever else they were doing—they’d get old tortoise shell and stretch goatskin and use movable frets. They really knew a lot about this stuff. They knew every scale of every culture in the world. I was playing guitar then, and eventually I was just like, I’ve got to build a guitar! So, I ordered a Martin dreadnought and studied it over and basically just copied it, but I used maple instead. My second guitar was based on a Martin OM, but it didn’t end up looking like that at all. I did brown rosettes and things like that, and I’d mess with the design just because I was trying to make it my own. 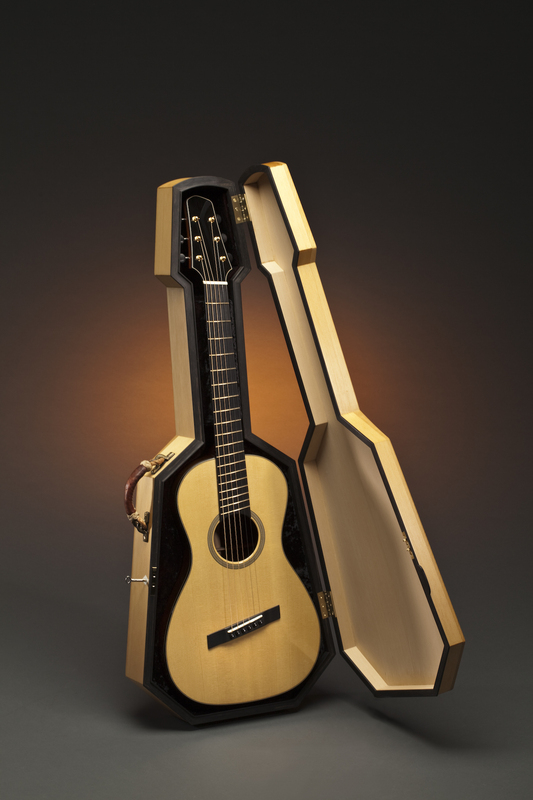 But then I really got into Martin guitars and I started shaping the bodies closer to the originals. I did that for about 15 guitars then went back and started doing my own designs again. A lot of those guitars were similar to what I’m still doing now, but they weren’t quite as refined. They still sounded good though. Austin was a big music city and there were tons of musicians around. Every touring act stopped in Austin, and I met a lot of really well-known musicians, worked on their guitars, sold a bunch of instruments to these guys. There’s even this one guy who’s been in Austin for longer than I was who told me recently that he still has the acoustic I made for him. He said Stevie Ray Vaughn used to borrow it and even took it into the studio, but he never released the acoustic recording, so we’re always trying to dig up those tapes. That would be awesome to hear. But there were always musicians around and I knew a lot of them. By that time, I was pretty well established as a guitar maker at least in Texas, and it was pretty easy to be a guitar maker because there weren’t that many of us around then. I sort of had the market cornered. Those were pretty wild times. EC: I have a big shop here in Santa Cruz on the other side of town from where I live. It’s about 1,400 square feet and I keep all my big machinery there along with a big metal spray booth. I go down there to prep the wood with sanders and joiners and all that stuff, rough out neck blanks and sand the tops, then I bring all the parts back to my home studio and build the guitars here. If they require lacquer, they make one more trip over to the other place, but I work out of my home place 90 percent of the time. The place on the other side of town has a pretty cool story, though. It was an old factory where they used to make wooden vegetable crates with real colorful labels and everything. They made them by the millions. There are these gnarly bolts still in the shop where they had a big soaking tank and a lot peeler. So, they’d soak the logs then chuck them up on this peeler and spin them around and slice off veneers. It’s got a lot of cool history. The woman who owned the building recently passed, but she told me that when she was little and her father owned the place, any time city revenuers would come down, they’d chase them off with a shotgun. That was 70 years ago—I wouldn’t recommend trying that anymore! But now that she’s gone, they’ll probably tear the place down and develop it since it’s one of those million-dollar-per-square-inch kinds of places. That’s not the end of the world for me since, like I said, I’m slowing down a bit and trying to do as much out of my home as I can. The home shop is beautiful and the best part is that I don’t have to drive anywhere for days on end. FJ: Do you have a particular philosophy about wood/materials or building as a whole? EC: My philosophy is just that you have to make a guitar that sounds good. A lot of collectors are into big names, and I’m not nearly as well-known as some of the others. Could be that I don’t go to any of the guitar shows any more and I’m not really concerned about the fame or anything like that. I just stay home and make guitars, and if they sound and play great, that’s all I care about. I never get carried away with the design and try to make it different just for the sake of being different like I might have done a bit when I was just starting out. My guitars have a distinctive look, but they don’t look like Martins. At this stage in the game, just making a nice guitar is pretty easy for me to do, easy for anyone who’s been doing the same thing for 40 years or more. It just becomes second nature. 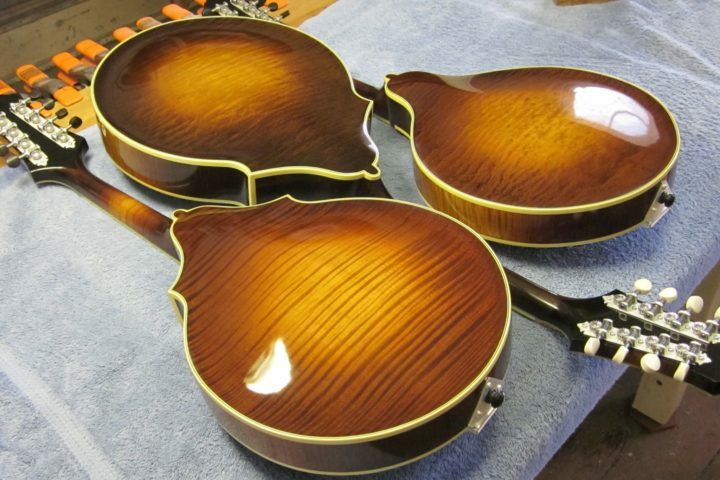 As long as you have good tone woods, you really can’t miss. If you try to use a wimpy top, you won’t get the results you’re after. My guitars are really consistent, and people tell me that no matter what model of my guitars they play, they all sound like mine, the way all Martins are going to sound like Martins. That’s got to do with the tonewoods I use. I’ve been hoarding good tonewoods for years. 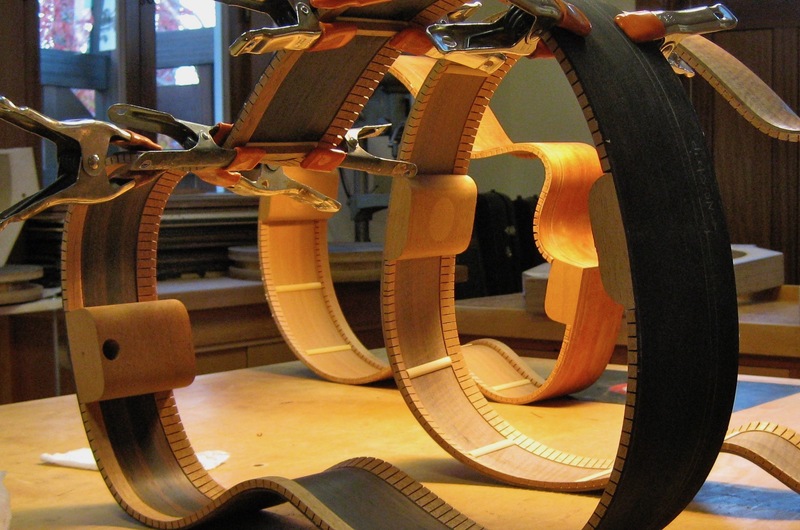 Beyond just having the right wood, you need to make sure the top and back and every other part of the guitar is in harmony with each other. It’s basically the same philosophy that guitar makers a hundred years ago had, before amplification and all that: If your guitar doesn’t sound good, another company is going to get your business. The guitars I build appeal to a lot of people in that they’re not weird, but they’re not just blatant copies of traditional guitars. It’s the same thing a lot of modern builders are doing and, like them, I never cut corners or do something that would reduce the work just for the sake of more money. I think people are always looking for the holy grail of a guitar, the best guitar that’s ever been made. But there’s really no such thing. They have 10 guitars and they’re always buying and selling trying to get “the one,” but I think they’re never going to be satisfied. I don’t think a guitar needs to be the holy grail to be a great instrument. As far as being an independent builder, I’ve always been my own boss, always gotten to call the shots, never had to punch a time clock. To me, that’s invaluable—I don’t think I’d do well in the workforce. Especially now that I’m slowing down, I like being able to build just what appeals to me. People have come to me asking for Koa guitars, but it’s just not something that interests me all that much, and I like the freedom to turn a project down in favor of something I’m going to enjoy building. EC: When I was going to the guitar shows, I’d always try to have something really fancy and special, but I don’t do that circuit anymore and I’m comfortable just doing what I’m doing now. Something that I’m excited about is switching over to non-lacquer finished guitars. I’m sort of over the really shiny lacquered guitars, and I want to try this because it’s been in my head a while. I want to make guitars that not only look nice but that also have a nice tactile feeling. If you pick up a classical guitar that’s been French polished, it just looks and feels different than traditional lacquer finishes. It’s like day and night. And the good thing about them not being so shiny is you don’t have to worry so much about scratching them up or having that ding that haunts you. You get to relax! But beyond that, I just think a non-lacquered finish seems more organic. I honestly think shiny finishes on guitars detract from their natural beauty. And plus, I do all the finishing and polishing by hand, and that adds up to a lot of time. But when I do French polishes, they just look so beautiful to me. There’s something about it that looks more living than just a thick plastic coating. And they age so beautifully. I’ve got a bunch of ideas that I’d like to pursue but just never had the time. Now that I’m slowing down and being more selective, I’m going to start doing those things that I’ve really been wanting to do, and I think they’ll be a big hit. I’d even like to go back and make some of the stuff I was making in the early 1970s, the instruments I was making before guitars. They were a great deal of fun. Like I’ve said, I’m fixing to retire, but I’m never going to stop making them.